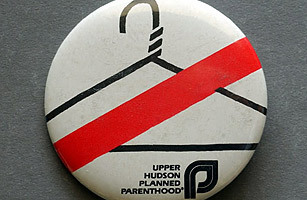 A pin evoking the horror of illegal abortion. The world was about to change for women that Monday morning, but only the nine U.S. Supreme Court Justices and a few court personnel knew it. The second case on the docket that day was Roe v. Wade, which challenged the Texas laws making virtually all abortions illegal. Justice Harry Blackmun read the decision he had written declaring the laws unconstitutional, which had passed by a vote of 7 to 2. I was in Austin, Texas, a recently elected legislator, and unaware of what was going on in Washington, even though I had filed and argued Roe v. Wade. Roe began in 1969 when a group of University of Texas graduate students asked whether they could be prosecuted as accomplices to abortion if they shared information about where to get illegal abortions or out-of-state legal ones. I was 24, a woman lawyer and willing to do the case for free. We found a 1965 Supreme Court case overturning a Connecticut law making it a crime to use birth control, as well as cases in other states challenging antiabortion statutes. We decided to challenge the Texas laws. A pregnant woman called Jane Roe was the plaintiff in the class action we filed against Henry Wade, the district attorney of Dallas County. As Blackmun's words faded in D.C. that Monday, phones began ringing in the law offices my husband Ron and I shared. We learned we had won from reporters. But we didn't know exactly what the court's decision said until a friend in Washington went to the court, got a copy and read the entire document to me over the phone. The opinion said women had a constitutional right to make private decisions about whether to continue or terminate a pregnancy, and that the state had not proven a compelling reason to regulate that. Abortion was legal. A woman scheduled to leave Austin on a 3 p.m. plane for a California abortion was instead given one by her local doctor that afternoon. After Roe, the ability of women to make choices expanded. But the controversy did not end. Thirty years later, the debate over abortion law has only intensified.